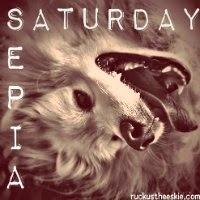 Ruckus the Eskie: Sepia Saturday #124: Two for Me, None for You! OOH! Now, that's some real good shopping there Ruckus!! Bet there are some wonderfully beautiful things in the bags! Doesn't your nose get tired, or hurt from holdin' that bag? I'll bet you look sharp in your Burberry clothing. I shop at PURRberry. Now Ruckus, don't be selfish. Yup! That sounds about right, Ruckus. Burberry would look so good on YOU!